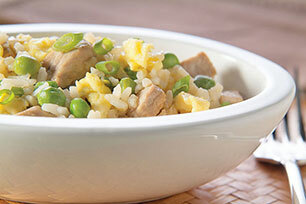 This tasty rice dish is sure to satisfy everyone with hardly any effort! Combine rice and broth in microwaveable bowl; cover. Microwave on HIGH 5 min. Let stand 5 min. or until liquid is absorbed. Meanwhile, heat 1 tsp. of the oil in large nonstick skillet on medium-high heat. Add eggs; cook and stir 2 min. or until eggs are set but still moist. Remove from skillet; cover to keep warm. Cook meat in remaining 1 tsp. oil in same skillet 5 min. or until cooked through, stirring occasionally. Add peas, onions and dressing; mix well. Stir in rice and eggs; cook 2 min. or until heated through. This is a great way to use leftover cooked rice. Just prepare recipe as directed, omitting the chicken broth, skipping the rice cooking step and substituting 2-2/3 cups leftover cooked rice for the 1-1/2 cups uncooked rice.